Ushering a new dawn for his music, Nigerian Entrepreneur, MR OGEDEGBE LUCKY breaks new grounds with the unveiling of his company Game BOSS EMPIRE, which is a full-on 360 music and entertainment company aimed at redefining the business of music in Africa, and more. Game Boss Empire is a wholly independent Music Label, created to promote Africa Music to capture the world’s attention at large. 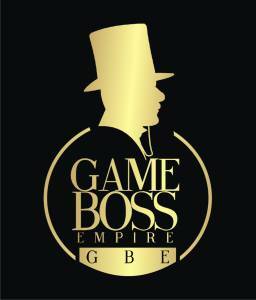 Game Boss Empire was founded in 2017 by legendary business pioneer Mr Ogedegbe Lucky. GBE is going to be one of the Most Influential Label in the business with an eclectic Musical Mix and Record Deal that will expand from it Origins/Artistes in traditional folk, ethnic music, hip-hop, soul, RnB and afro-pop production. GBE was one of the primary forces in contemporary folk in the year 2017, virtually inventing the artist-driven environment that fueled the Nigeria Sounds across the nation. It is one of the first Nigeria Record Label to “go global” border-crossing successes without any Act in it. 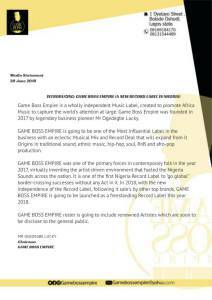 In 2018, with the new independence of the Record Label, following it sale’s by other top brands, GAME BOSS EMPIRE is going to be launched as a freestanding Record Label this year 2018. GBE roster is going to include renowned Artistes which are soon to be disclose to the general public.